Arms is every bit as simple to pick up and learn as it looks, regardless of your play style. More than that, it's just plain fun. Our review. When Nintendo first revealed the Switch, the publisher brought out a lot of its first-party big guns. But in-between the Marios and the Zeldas, there was an intriguing new IP that caught some eyeballs. It involved crazy extend-o limbs in a third-party fighting game, something new from the Nintendo machine. On the surface, Arms looks like a shallow experience. Move around and punch your friends with comically-large arms, whether alone or at a party. But not only do the game's mechanics keep it feeling fresh, there's a deep catalog of unlocks that help keep the party going strong. The third-party fighter is an uncommon sight in the gaming world and the prospect of motion control sounds terrifying at first. Anyone that has endured the Wii and Kinect generations know the perils that motion controls present. Arms overcomes these pitfalls, thanks to easy-to-learn mechanics and the Joy-Con controllers capably reading every gesture. Leaning the controllers in a direction moves fighters, while the triggers control dashes and jumps. Most importantly of all, punching works and it feels good. The idea is less about flailing uncontrollably and is more about delivering deliberate motions, even allowing users to hook their punches to control their direction. It's exceptionally easy to pick up and leads to competitive battles with both the CPU and real-world friends. Traditional controls are also in place and that offers its own set of pros and cons. Dashing, jumping, and punching are tied to the face buttons, while the left analog stick moves the fighter. Since the Joy-Con relies so much on the trigger buttons, it's easy to get these control sets mixed up. However, both are easy to pick up and grasp, making Joy-Con versus Pro Controller matchups a simple reality. Players will spend a bulk of their time playing standard Arms battles. Fights are a rock-paper-scissors arrangement between punches, throws, and blocks, with each character offering a unique trait that brings variety to each fight. On top of that, the individual arms all have their own traits and abilities that mix things up further. While the fighting game principles remain front and center, these tweaks prevent fights from getting stale. They're also good for helping players find their specific style, whether it's smash-mouth brawling or tactical finesse fighting. While Grand Prix and Versus comprise the bulk of the game, there are other game modes that help mix things up. V-Ball and Hoops offer twists on volleyball and basketball, respectively, while Skillshot has fighters aim for targets. They won't replace the main game mode and start to feel old quickly, but they're a nice distraction. They're particularly welcome in Grand Prix, where they add some needed variety. The most intriguing of the secondary modes, however, is the Arms Test. This gives fighters random sets of Arms to play with, allowing players to experiment with different combinations in single one-round settings. These sessions move at a brisk pace, helping reduce some of the monotony of the Grand Prix mode. Anyone coming out of the Arms Test mode will likely want to pick up some of those new arms for themselves. 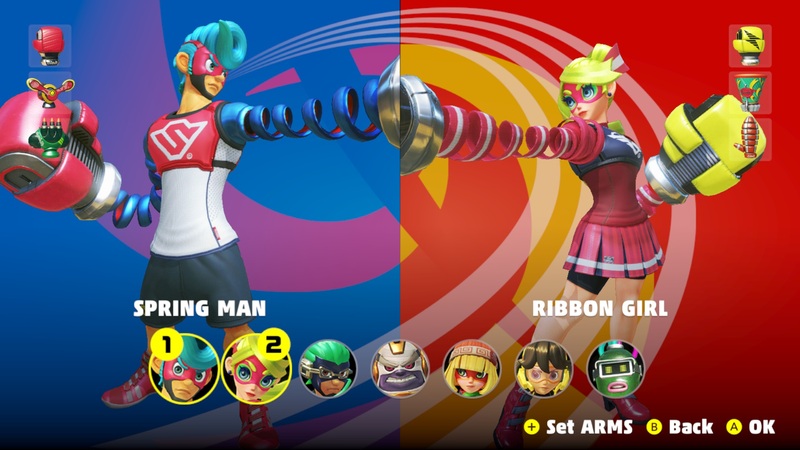 This is where Arms shines, as there are dozens of unlockable arms to pick up, all of which can be equipped to different fighters' loadouts. 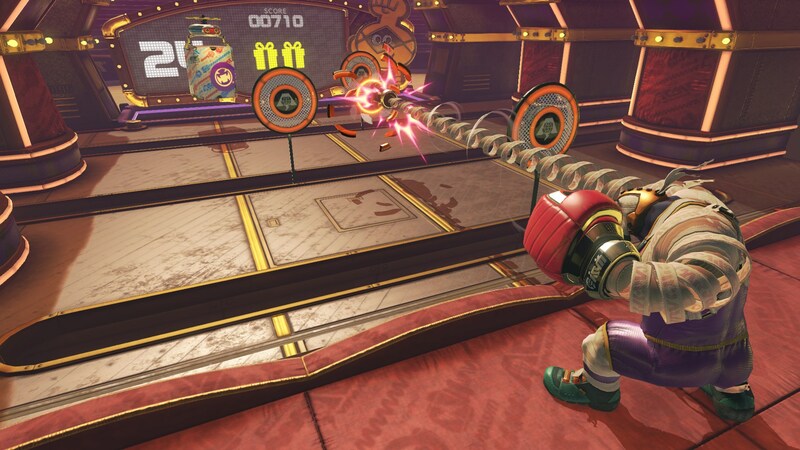 In order to get these arms, players spend their in-game currency on a Skillshot-style mini-game. The more currency they spend, the more time they'll get with the mini-game, allowing for bigger hauls. The trouble here is that earning currency is a huge grind. Playing around with some of the Versus game modes are usually only good for a single unit, which makes aiming for 100 units (the cost for the max time with the mini-game) a total slog. And getting the right set of arms still isn't a guarantee at that point. Arms feels like a must for small parties. If there are enough Joy-Cons to go around, it's bound to be a crowd-pleaser. And to Nintendo's credit, while Arms feels like it's built for motion control, it doesn't leave behind those looking to stick with traditional controls. Arms sessions are quick, fun, and satisfying. 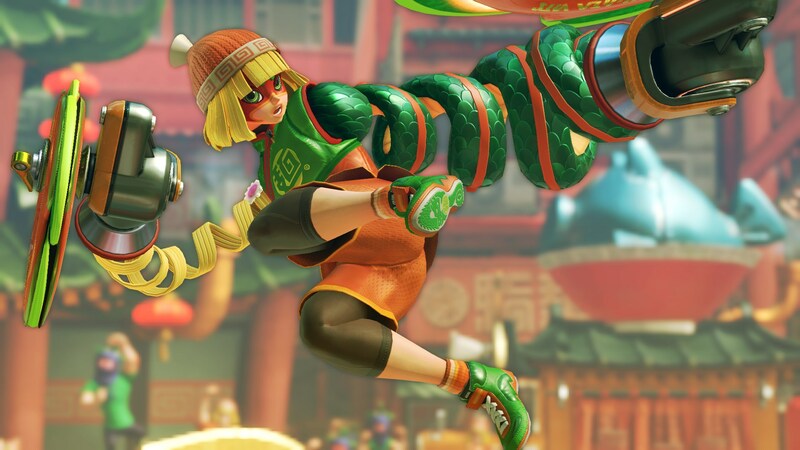 With easy-to-pick-up mechanics, solid stage design, and quirky characters, Arms genuinely feels like a fun and different addition to the fighting game genre. More than that, it feels like just the kind of game that makes the Nintendo Switch itself feel fun and different. This review is based on a Nintendo Switch download code provided by the publisher. Arms will be available in retail stores and the Nintendo eShop on June 16 for $59.99. The game is rated E10+.